Pet Ninja Saga are creatures that support ninja character in battle. 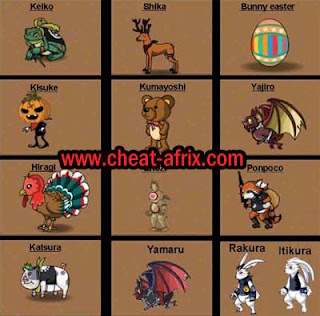 They can be purchased at a Pet Shopor a ninja by Chunin rank higher. In addition, you can exchange 25 friendship kunai (by inviting friends) to Kame, Katsura, or Takachi (Takachi). Animals get 20% of the profits from the mission and player XP battle. Animals that are disabled can be leveled at the Villa Pet by paying with Gold and wait for some time. 2 Responses to "Cheat : PET Ninja Saga April 2013"